I don’t know about you, but when the sun’s out and the mercury is rising, my inclination is to go make-up free. I like to feel the sun on my skin (I’ll be wearing sunscreen, natch) and to take advantage of the vitamin D boost I get from its rays. There are summer occasions, however, that demand a properly made-up face. So this week I’ve called on the experts of the fabulous Daniel Sandler – make-up artist extraordinaire and all-round beauty guru – to conjure the perfect summer party look. Begin with a light base like Vichy Aera Tint Pure Cream Foundation for a fresh, dewy finish – or if your skin’s a bit more blemish-prone, opt for a foundation with a bit more coverage such as Clarins Skin Illusion Foundation. 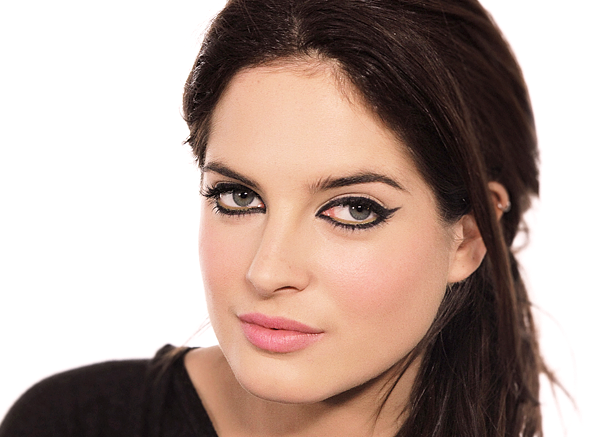 Draw your eyeliner pencil along the upper lash line. Daniel used black, but you could try purple, dark green or inky blue for an added hit of colour. Look out for a waterproof eyeliner pencil (especially in the summer months when it’s hot and sticky) as this will help the lock the colour in place – try Clarins’excellent Waterproof Eyeliner Pencil. Draw the colour from inner to outer corners of your eyes, and then along the lower lash line, extending out into a flick. You can also try a liquid liner such as Guerlain Liquid Eyeliner for a more defined winged effect. Now take bareMinerals Lasting Line eyeliner in Eternal Bronze, a luscious golden hue, and draw it along the water line to make your eyes really pop.Finally,volumise upper and lower lashes with a coat of Daniel Sandler Jumbo Jet mascara. If you’re a bit more daring with your make-up, try the Watercolour Blusher in the vivid orange Trip shade for a super-cool rave-style look. You can also use Daniel’s Watercolour Blusher on your lips as a lip stain, simply dabbed on with your fingertip. It’s simple, easy and super-effective. The great thing about this look is that it doesn’t use too many products and is quick to apply – so my face doesn’t feel heavily clogged with make-up and yet I look glam enough for a special summer party. Now all I need is an exciting invitation and I’m good to go! Until next week, stay beautiful. This entry was posted on Friday, July 4th, 2014 at 4:53 pm and is filed under Binky's Beauty Blog #BBB, Make-up, Video. You can follow any responses to this entry through the RSS 2.0 feed. You can skip to the end and leave a response. Pinging is currently not allowed.